Carton Serialization Modules - Xyntek Inc.
Serialization is the assigment and application of a serial number to any individual sellable item (carton or bottle). This product identifier must be unique and verifiable. The information required in a serialization process is strongly dependant on the many different laws and standards. It is the complete family of serialization modules compliant to the current and upcoming regulations on traceability and e-pedigree, designed to assure the greatest flexibility towards different requirements from different State Authorities. The Print & Check series specifically support serialization functions: those standalone/in-line modules print all the fixed and variable data on the cartons by means of inkjet or laser technique and check the correctness and integrity of the printed data. Besides printing and verifying the Datamatrix and variable data, Print & Check can integrate labelling modules for “French vignette” or “Italian Bollino”, check-weigher, and tamper-evident-seal modules thus allowing a great saving of space on the packaging lines. 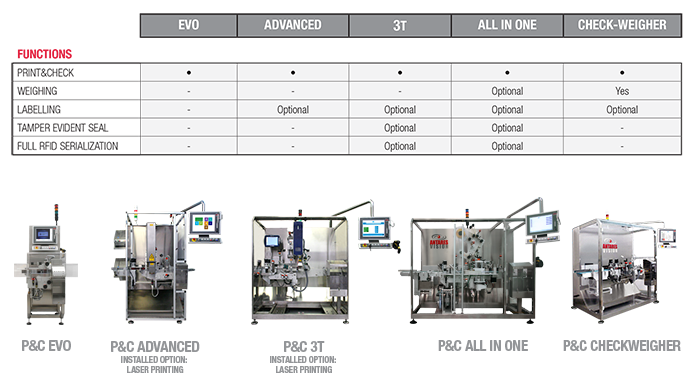 A compact space-saving system incorporating all the necessary components: printers, cameras, reject station, man/machine interface, continuity group. The first model was developed in 2007, and so far over 460 fully aggregated modules have already been installed in Track & Trace projects. A wide range of models and options to cover all different product and line requirements.